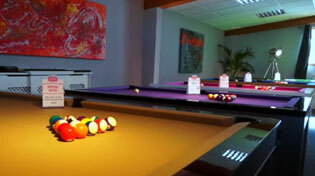 Home Leisure Direct carries a great range of Cannon English Pool cues. In stock now for free delivery to the UK. Cannon English pool cues are produced by esteemed cue manufacturer Peradon, and offer incredible value for money in the pool cue market. Just like Peradon’s other cues, Cannon cues are made using quality ash woods, real brass ferrules, blue chrome tips and fitted with solid brass joints. There’s a Cannon cue to suit every player, with one-piece, two-piece as well as three-quarter length cues available. The range of styles available ensures that you'll find a Cannon cue to meet your needs without breaking the bank. Cannon cues provide excellent quality and play at an affordable price. All of our Cannon cues come with free delivery to mainland UK. However, for locations outside the UK mainland there may be an additional charge depending upon your exact location. Please call our friendly customer service team on 0800 622 6464 for a quote. Visit our showrooms to see the range of Cannon cues we currently have in stock. You can try each of them out for yourself, and ask our experienced staff anything you need to point you in the right direction of your perfect cue.